After the sacred marriage ceremony of lord Shiva-Parbati, the newly wedded couple have paid a visit to the city to bless the devotees. The couple after tying their knot returned to the temple and on the midnight started their visit to the city with other deities. In a well decorated Chariot the godly couple created an ambiance of real marriage and the only exception was people in lakhs were on the streets to see the couple. 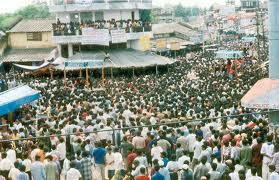 Places like Nandapada, Jhaduapada, Mudipada are crowded being Shitalsasthi and Shiva-parbati Marriage is done here. 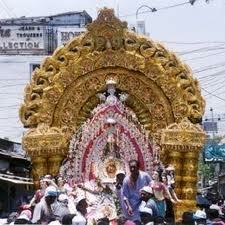 The Bambarada Balunkeswar of Nandapada along with Parbati visiting in the city along with Sakhigopal, Panchabaktra & Nrusgha in a Chariot made of Parabha. Tablues on the theme of Women Education, Wildlife Conservation, Sambalpuri Culture & Sunstroke Awareness were also a part of the yatra. 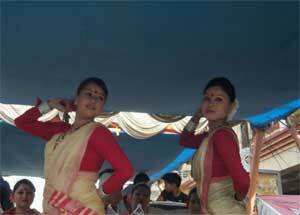 Megha Dance of Puri, Ghanta party from Bolangir and Bargarh, Darpan of Chhatisgarha, Madal, Dandapat, Odissi, Tribhngi, Dhankuta, Jodi Sankha of Berhumpur, Bhangda, Dholki of Patna, Kobra of Waltier, Ghoda-Bagha, Chhau Dance etc werethe attraction in Cultural programmes. Lord Lokanatha & Parbati along with Radhakrushna, Hanuman & Panchabaktra of Jhaduapada started their yatra in a well decorated chariot. In the procession more than 25 cultural programme teams have participated. Artists from Punjab, Bihar, Chhatisgarh have participated along with other cultural teams. The main attraction of Mudipada Yatra was the local artist’s decorated Chariot made with parabha where Jageswar Mahadev-Parbati, Radhakrushna & Hanuman started their yatra. Tablues on the theme of Sai Baba, Sachin’s 100th Century, Wildman, Cow Conservaton etc were attracting people around Sambalpur. Cultural parties from different part of the state are performing in the yatra while artists from Assam, Rajsthan & Cuttack were performing danceand music on mobile stages. Sitaleswar of Badabazar, Pahadeswar of Budharaja, Madhata of Maneswar, Gupteswar of Thakurpada, Tarakeswar of sindurapanka, Nilakantheswar of Hirakud also have started their yatra in the city. All the deities will return to the temple by Sunday evening.